Summary: The blog illustrates about the OST files and the errors have been detected in the file Outlook.ost error. Various manual and automated methods to fix the error have also been explained clearly. OST file, which stand for ‘Offline Storage Table‘ file is a replica of the complete data in the mailbox of Outlook. Many users use OST file to work on Outlook in offline mode. The modifications made by Outlook user in offline mode will be saved in OST file and are automatically sync with MS Outlook when connected to the Exchange Server. 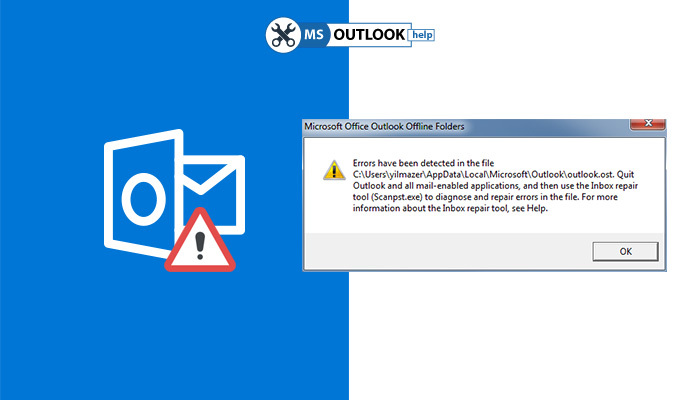 There are scenarios when users encounter errors in MS Outlook and cannot access it. Such errors occur mostly due to synchronization problems. These issues need to be fixed immediately or it may lead to loss of data and other problems. One such error is errors have been detected in the file Outlook.ost. Workarounds to resolve this error is by using both manual as well as automated method like OST to PST Converter. Thus, trying any of the above methods users can easily resolve the error & allow users to work with Outlook without any hassle. Now, let’s have a brief of the reasons that make the occurrence of errors have been detected in the file Outlook.ost error. Corruption in the file system. Interruption of Outlook when synchronization of Outlook-Exchange server is in process. Abruptly shutting down the system. Termination of Outlook in an incorrect way. Virus or malware infection in the OST file. I have introduced some reliable and simple methods using which the user can resolve the Errors has been detected in the file Outlook.ost error in Outlook 2016, 2013. Users can substitute the damaged OST file with the backed up copy to fix this error. However, there is a sort of limitation in this method. If you have not created backup frequently, using this method you may lose your precious data. Microsoft offers its users two in-built inbox repair utilities i.e. scanPST.exe and scanOST.exe to repair the issues with data files in Outlook. These tools can repair the minor bugs and issues associated with PST and OST files respectively. But, there are also some drawbacks of this method. Using scanOST.exe inbox repair tool, we can only fix the minor issues. For major issues like errors have been detected in the file Outlook.ost we can’t resolve using these tools. Also, this tool is not available in Outlook version beyond 2007 i.e. if you are facing errors in Outlook 2016, 2013 and 2010, you can’t use this utility as it won’t be available. First, locate the scanost.exe on your machine. Now right-click on it and run as an administrator. As you double-click on scanost.exe, the Microsoft Outlook Inbox Repair Tool window will appear. Now select corrupted OST file. Now, choose the folders you want to scan. You may select Scan all folders , or you may select particular folder from the list. Click on checkbox Repair Errors to resolve the issues. Now click on Begin Scan to start the scanning of selected OST file. Within a short span of time, you’ll receive a message saying “OST repaired successfully”. Then, click OK. Choose the option “Clear Offline Items” the additional dialog box that will appear. After following the detailed steps, delete OST file. When Outlook get synchronized with Exchange, a new OST file is automatically created & all the data in the Exchange mailbox gets downloaded into it. Generally, the above explained manual methods are able to fix the corrupted Outlook OST file causing errors have been detected in the file Outlook.ost issue. But, in case the issue is still not resolved, the only option left is to convert OST to PST file format using a third-party tool. Successfully repairs and restores all the Outlook mailbox items including emails, Calendars, Contacts, Journals etc. No size limitation. Tested up to 80 GB Successfully. Save your recovered output into multiple file format such as PST, MBOX, MSG, DBX, and EML. Highly durable with password protected and encrypted Outlook file. Featured with fast scanning mode that enables to scan file safely. For avoiding data loss, errors should be eliminated immediately so that Outlook remain accessible. In the above article, we have discussed all the possible methods to remove Errors have been detected in the file Outlook.ost issue. By using manual methods, one could fix this error. But, if the problem still not get resolved, Use OST to PST converter without any doubt. Hope it helps. © 2019 MS Outlook Help | Designed by TechEngage. | Powered by WordPress.